Manage your email AND social networking messages from one inbox with FUSER. 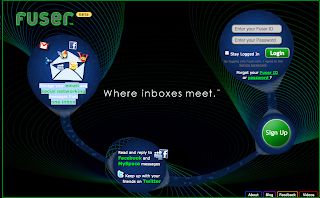 Finding it a huge headache to keep track of all of your mail from your email accounts and social networking sites? Then you've got to give Fuser a whirl. Fuser will actually organize all of your messages into one handy spot (like Gmail, for example). So say for instance you get a message sent to you on Facebook, it will appear right in your email account like a real email! And once you open it up, you can reply back (within your email) to return the message to your friend's wall or Facebook account. And they'll never know the difference. How great is that? Thanks Mz. Fran for blogging about Fuser - we're really excited about all the positive feedback we've received so far about our release. We're so glad that you found Fuser and that it's useful to you - let me know if you run into any problems or have questions!